It's been quite awhile since I sat down and did any crocheting. 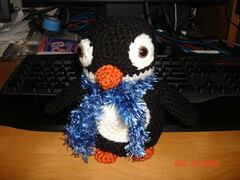 For my sister in law's birthday I made her this cute little penguin since she likes penguins. It was easy enough to make. Yarn used was just standard acrylic yarn. This should of taken only a few hours to make but I got sidetracked so it took me a couple of days. I think he went to a happy home!